It’s been a while since my last post and I apologize for it. Took me a while to think of what to make for my comeback and how to express my gratitude for all your letters of support, simple hello messages and letting me know you are here, missing me and waiting for me to return. I have no words to thank you! Your selfless and generous hears have left me speechless. What I can do is to make many more free patterns available for you to enjoy, and to try to help you whenever needed. As you can see, there are some changes on this web, and I am still working on it. I have extended it in order to add shop. Through the shop I will add some of my patterns which I have for sale. In time will add finished toys done by myself and my friends as well as materials (specially local ones) I use in my creations that are not available in your country. This way I invite all to join me in this venture. If you are interested in selling pattern or finished product on this shop, please feel free to contact me and we’ll find solution suitable for both. We can talk more about shop later…and as I said, feel free to email me if having any questions. Today I wish to show you Baby Unicorn which was born last week. Double knit cotton yarn in white for major parts of head and body. Secondary color of your choice for accents on head, arms and legs. Color of your choice for mane and tail. If you choose to make mane and tail in multicolor yarns, choose 5 different colors. Work in continuous rounds or spiral work unless stated different. Start working with light blue, pink or any other color yarn you choose to make nose. On the last stitch of the previous round change color to white and continue. Embroider white lines or dots on each of the eye to bring life to them or use textile paint and add white dots as you can see I made on photo aside. Stuff the leg nice and firm, flatten the last row and stitch through both sides making 8sts across. Tie off and leave long end for sewing later. Working the last stitch on the previous round change color to white and continue. Stuff the arm nice and firm. Flatten last row and stitch through both sides with 5sts across. Tie off leaving long end for sewing later. Tie off leaving long end for sewing. Stuff the body nice and firm. Use yarn in different colors. I’ve chosen nice pastel colors, but you don’t have to follow my lead. Important is to make 5 pairs of mane which will be sewed on head later. Use same colors as used for mane. Make 5 hairs for tail. Tie off leaving long end for sewing tail later. 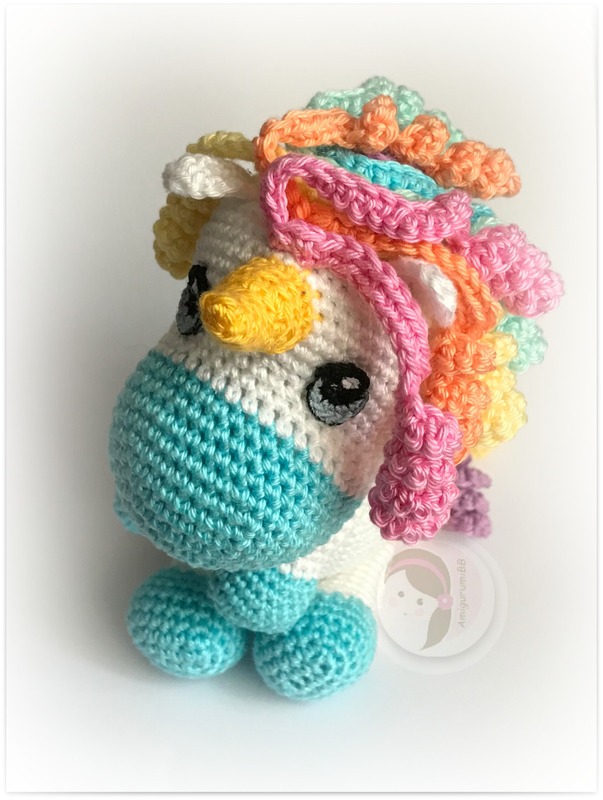 Free Patterns Page or using direct link to Baby Unicorn. Hope you like it so far and much more I am looking for is to see your Baby Unicorns made and ready to play with. That is all for now! Looking forward to my next post and hearing from you meantime.